32oz vegetable stock - More Than Gourmet is my favorite brand. In a soup pot, dry saute onions. Add in greens, beans, chipotle peppers, vegetable stock and water. Stir well and cover. Meanwhile, whisk together flour, cornmeal, honey, baking powder, salt and soy milk. With wet hands, or two spoons, roll rounded tablespoons of dough into balls. (This is a very sticky batter - don't expect them to come out like perfect balls; don't freak out - they will cook up and hold up once they drop into the boiling soup pot... Even if you just spoon them in little by little.) Once soup water starts to boil, gently place dumplings into soup. Cook, covered and undisturbed, over low heat until dumplings are puffed and cooked through, about 15 - 20min. There comes a time in every kitties life, when they need to undergo a special surgery that leaves them - cone headed. They don't understand anything afterwords; besides the fact that they now have a cone attached to their head. Their emotions go from confused and frustrated, to (if your lucky) accepting. 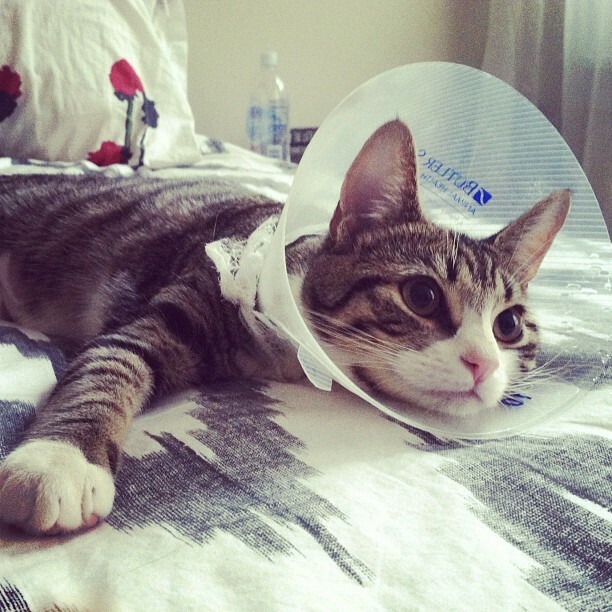 "This is my life now; I'm a cone-headed kitty." Luckily for us, Minou has accepted her new look, and has been her loving, playful, dairy-free ice cream eating self. We love her, and hope she knows this isn't forever. She needs as much love as she can get to reassure she's still a beautiful kitty. Isn't she as beautiful as ever?! I made these fries from start to finish and still can't believe they weren't fried. They would taste great on a hot sunny day, laying out on the beach, with a cold glass of beer (a girl can dream). Mmmm... they are SO good! I was worried I wouldn't really be able to taste the lemon zest after they baked off - but you totally can... And the flavors are a perfect match in your mouth. Not only are these baked, they are fat-free and plant strong! I served these crispy delights as an appetizer with Sirracha straight up. If you or your guests aren't so bold; you (babies) may want to dilute the Sirracha with some all-natural ketchup. 1 tbsp very good mustard, like this one. splurge - it makes a difference. Pre-heat oven to 425º. Combine bread crumbs, lemon zest, salt and pepper together onto a large plate. In a small bowl, mix ground flax seeds, water and mustard together - let sit for 5-10min to form vegan egg substitute. Dip zucchini sticks first into flax seed mixture, then roll them in the bread crumb mixture on all sides. Lay coated zucchini pieces onto a nonstick baking sheet or lightly greased cookie sheet and bake for 20 - 25min until golden. Serve with Sirracha, fresh lemon, or your favorite dipping sauce. This week I received a beautiful bunch of local, organic, Japanese Turnips from my CSA. I decided to boil my turnips alongside a couple yellow potatoes to create a healthy side dish. The mash came out super creamy, slightly sweet, with a surprise cashew crunch! It's a perfect side to serve with some sauteed veggies and a roasted portobello. Boil potatoes and turnips until cooked; check done-ness with fork. Mash potatoes and turnips in VitaMix or by hand with nutritional yeast, garlic, cashews and splash of soy milk. Add more or less milk to desired consistency; more milk equals lighter, less milk equals thicker mash. Top with fresh scallions or sauteed mushrooms and onions! 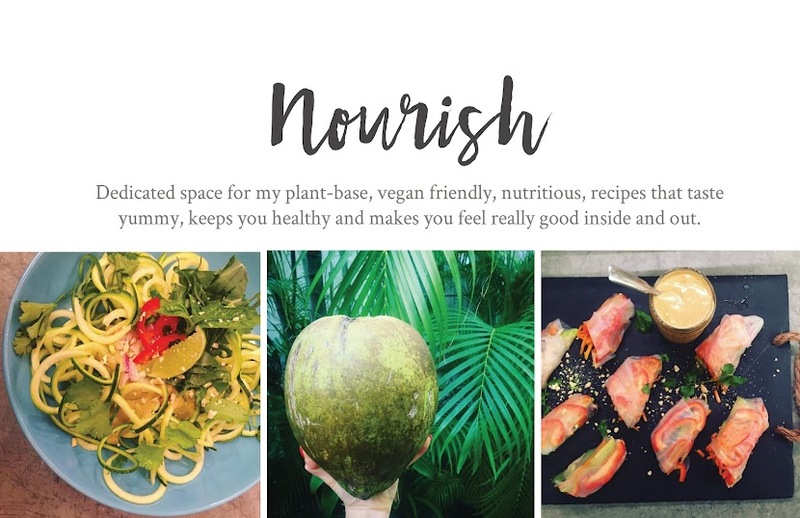 Summers almost over and I realized I haven't shared a recipe for one of my favorite cold soups - Gazpacho! It didn't take me a long time to figure out what to make with 5lbs of these beautiful, local, organic, heirloom tomatoes I was given this week, from my CSA. There are many variations to Gazpacho, you can't really go wrong... I personally like mine with a little kick of heat - which is not how you would have it traditionally in Spain, but that's how it's done in my kitchen! I put my Heirloom's through some hydrotherapy before blending; first they take a boiling hot bath and then dip into an ice cold tub where their waxy peel comes right off with the touch of your fingertips. After they're all peeled, they're ready to go into the blender. For some odd reason, anytime I make Gazpacho, it comes out orangy/yellow - and not red. Even when everything that's inside it is red, it still somehow turns yellow. It's this weird trick the tomatoes try to play on me - but they can't fool my taste buds! In a VitaMix or food processor, blend all ingriedants together until smooth. Cool for 2 hours or overnight. One of my bestest friends Lauren, and her super cool fiancé Jon, recently moved to Hawaii. Zach and I thought it would be great to go out there and give them a visit... it was the best idea ever. We all became one big happy family that explored and adventured together. 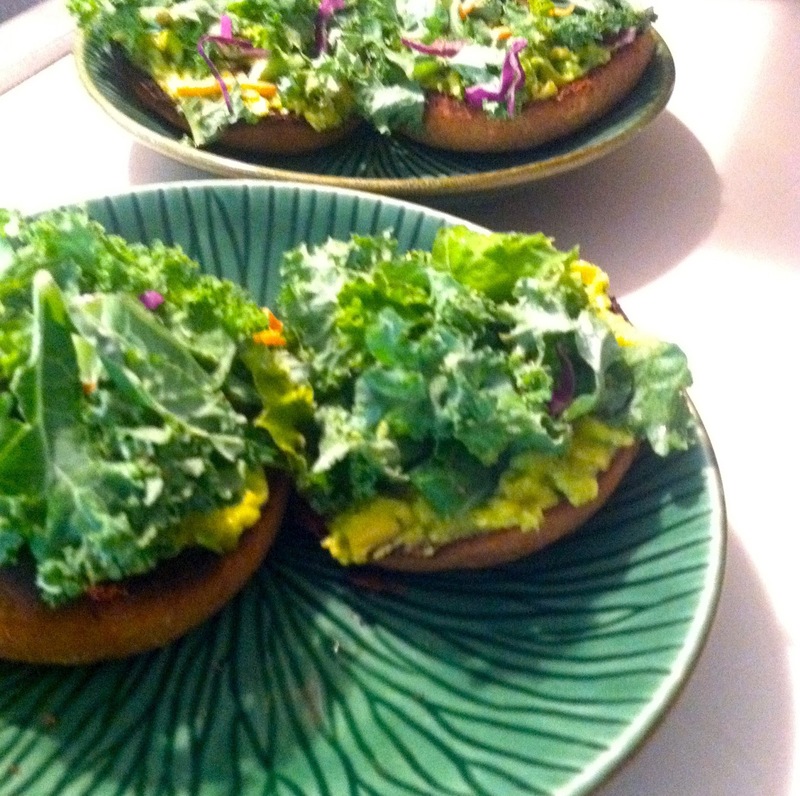 breakfast: sprouted grain bagels, avocado mash & kale!